A recurring question inevitably arises in a representative government: Where does the responsibility of the representative lie, with the wishes of the people who elected him, or to his better judgement? On November 9th, 2017. The United States Department of Agriculture (USDA) announced that the Organic Livestock and Poultry Practices (OLPP) final rule, which defines livestock living conditions for poultry and specifically outdoor access and indoor stocking densities, will have the effective date delayed (again) to May 14th 2018. This was done despite an overwhelming support for implementing the rule from consumers and producers. From over 47,000 comments submitted, 40,000 of them were in favor of implementing the rule, with 28 suggesting withdrawal and only 1 commenter recommending delay. With such a high volume of support from the consumer and producer community, on the surface it is surprising that the USDA would delay the rule again. Yet beneath that surface bubbles the main policy balance the USDA is trying to navigate: satisfying consumers and producers. Producers inevitably fall into two categories on this issue, those who are for it, regarding it as a request based on consumer demand, and those who are constitutionally against, regarding the consumers opinion misguided and irrelevant. Many producers are in favor of this rule, especially the smaller operators who already in some way or another conform to many of the requirements in the new regulations. Those among them who have stocking densities that are higher, or need to add a little more pasture are satisfied to so long as it gives them a level competition with everyone else. 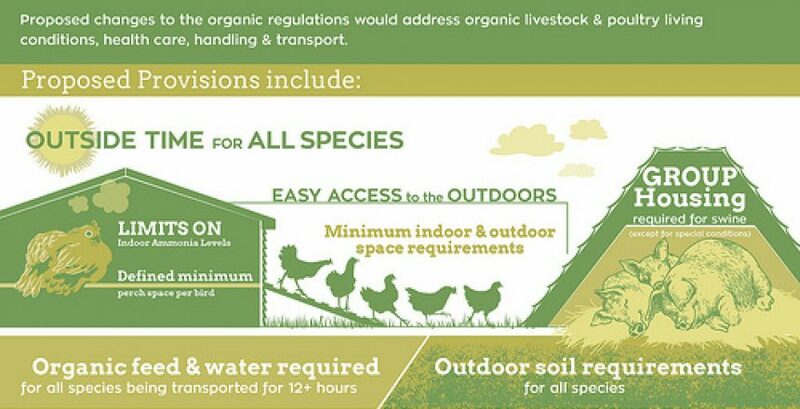 Not surprisingly, those who have the most to loose are the producers who have taken advantage of the loose definitions of “outdoor access” in the standards, keeping large factory farm conditions for poultry, while still meeting the minimum requirements of the Organic standards. For these Producer’s implementation of the rule would require large alterations in their productions systems, including large construction costs to build new pasture and buildings for their poultry. Reducing the over all net revenue by having less poultry under a single roof. Those who have the most to lose, despite the possible infrastructure costs to the Producer, are the consumers who trust the Organic label. Frequently, with the abundance of food labels available on the shelf, consumers can become confused with what one means over another. Should they be purchasing Organic? Or would they be better off with a Certified Humane product? The purpose of the OLPP was to reenforce consumer confidence by matching the regulations to expectations, asking nothing more of Producers than similar standards for Humane Certification. It must be acknowledged that the Government, while wanting to balance the perspectives and viewpoints of both parties, is very likely trying to do their due diligence with the ramifications of the OLPP. Despite having studies and analysis showing the relative ease, and the approximate costs involved to Producer’s to implement this rule, they don’t want to count their chickens before they hatch. Especially in the wake of questioning the role and range of Government in American business and life, they likely do not want to over extend their reach, and are taking time to try solving the sore points diplomatically. One could argue however, that the accusation of overreaching government meddling is irrelevant in this instance. Because “Organic” a copyrighted Government regulated label, with Producers and consumers voluntary submitting to the standards (and paying for the privilege), they cannot overreach their jurisdiction. We asked at the beginning of the article a question regarding the responsibility of representative Government. Should it represent the will of the people, or the best judgement of those elected? In a previous article, I have gone on record arguing that the majority are not always right, and that our system of Government in the United States was designed with the intention of protecting the minority from the majority and vise versa. That being said, I think that in this instance the voice of the commentators should be the deciding factor for two reasons. First, the Organic seal and label is a marketing term that has always been fueled by market demand. Customers are literally paying for an Organic label, and should in turn receive the product they expect to be paying for. In a market economy the preference of the consumer should not be discounted. Second, those who approve and disapprove the policies in the Organic standards are not legislators, they are unelected bureaucrats who are by literal definition, “civil servants.” This is not a motion going before representatives of the states, but instead appointed personages who don’t have skin in the game. This event merely continues the divergence from the ideology of Organic farming and the regulations that protect it. Following up on this topic we will release a third article considering the differences created by this divergence, and the possible future that it holds for agriculture in general, and Organic farming in particular.